Akiyama Iwao was born in a small village in the South of Japan, in Oita prefecture on Kyushu Island. When he was 8 years old, he received drawing lessons from a Buddhist monk. Later he attended and graduated from the school of Taiheiyôgakai in 1956. 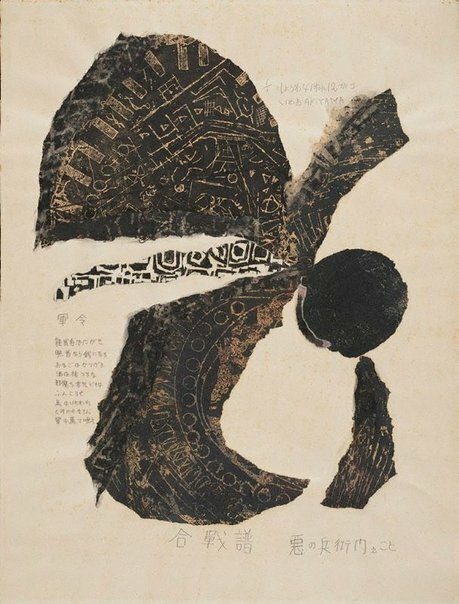 Originally trained in oil painting, the young artist turned to woodblock printmaking when he met Munakata Shikô (1903-1975), one of the most influential exponents of the Mingei movement. Akiyama studied with him from 1959 to 1965. The influence of his master on his style is evident. This collage belongs to Akiyama's early works, which are rather rare today. Asian Art Department, AGNSW, 2008.